Today's card features Jillibean Soup's Summer Red Raspberry Soup collection. Cut striped PP panel, round corners, and adhere to card. Die cut doily, trim approximately 40% and adhere to card. Adhere strip of butterfly PP across top of panel. 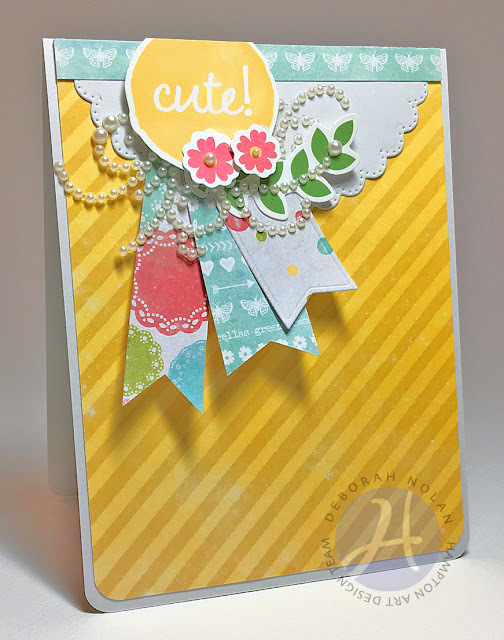 Die cut PP ribbons and adhere to card. Adhere PeaPod Parts and gems. Adhere sentiment PeaPod part with foam dimensional tape.